Hadoop startup Hortonworks has confirmed that its co-founder and CTO Eric Baldeschwieler is no longer with the company. We reported on evidence suggesting the move on Monday, and CEO Rob Bearden confirmed Baldeschwieler’s departure in a blog post on Tuesday. Hortonworks is the enterprise software company that spun off from Yahoo in 2011 to capitalize on the company’s immense experience in developing the open source Hadoop big data software. Baldeschwieler led Hadoop development at Yahoo and was Hortonworks CEO until February 2012, when Bearden took over the role. I’d like to share some thoughts on the recent news that Eric Baldeschwieler has decided to leave Hortonworks. I’d like to start off first by thanking Eric for his contributions to the Hadoop community since its inception over 7 years ago, and I’d like to express my personal appreciation for his help in getting Hortonworks off the ground. It’s hard to believe it’s been over two years since Hortonworks was founded by over 20 engineers from the original Yahoo! Hadoop development and operations team. That team’s origins came in 2005 when Eric assembled engineers to solve a really hard problem: store and process the data on the Internet in a simple, scalable and economically feasible way. Those were humble beginnings for an open source technology, namely Apache Hadoop, which now finds itself in 2013 very much at the center of next-generation big data architectures. With that said, I’d like to reiterate that we are extremely appreciative of all of Eric’s contributions over the past few years and wish him all the best in his future endeavors. There’s no word on why Baldeschwieler decided to leave or, perhaps, was pushed out the door. 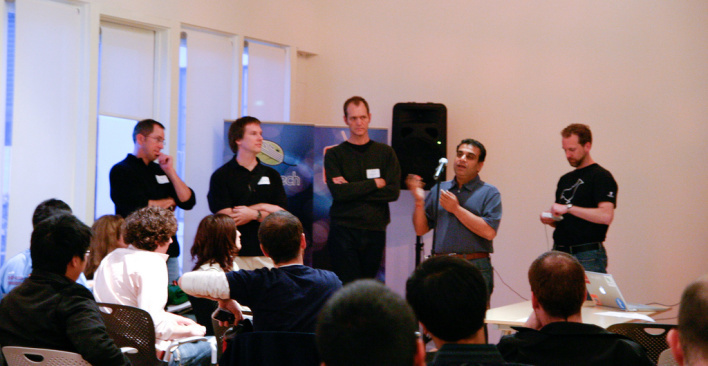 Baldeschwieler (second from left) at a GigaOM Hadoop meetup in 2008. One thing that’s certain, however, is that the Hadoop space has become hyper-competitive in the past couple years and personnel changes aren’t unheard of. Cloudera, Hortonworks’ primary competitor in providing Hadoop and services, has been without one of its co-founders — Christophe Biscliglia, who’s now co-founder and CEO of WibiData — since 2010. In June, Cloudera replaced co-founder and CEO Mike Olson with former Arcsight CEO Tom Reilly. Olson is now chief strategy officer. It’s difficult to gauge exactly what’s going on with Hortonworks, but there certainly are a lot of rumors and a lot of activity. In June, the company announced a $50 million Series C round of venture capital, which, it is rumored (according to database industry analyst Curt Monash) valued the company at $500 million. That was the first time Hortonworks had publicly announced how much it had raised in any round, although the prevailing belief is that the company took in $25 million apiece in its first two rounds. As Monash also noted, there’s a believable rumor that Intel recently tried to buy Hortonworks for $700 million. Microsoft tried to do the same in 2012, although at a price tag significantly less than what Intel offered. As far as business goes, it’s difficult to find Hortonworks end-user customers in the wild, but the company certainly has its fair share of partners. The Hortonworks distribution of Hadoop underpins the Hadoop strategies at Microsoft, Teradata and Rackspace, and technology vendors such as Continuuity and DataDirect Networks have built their Hadoop offerings atop it, as well. I think John Smiely is from Cloudera :-) HW is doing great and just 1 person leaving is not gonna have a great effect. Jon Smiley’s on someone’s payroll…what a load of crap…. Things are really going south at Hortonworks. Eric was very well liked there and highly respected by the engineers. The opposite is true of Rob Bearden. The company has recycled their entire employee base 3 or 4 times. Most of the people who have been there for 1+ year are very unhappy with things. Lots of fresh hires keep showing up to replace the jaded by reality people. They are struggling against keeping up with Cloudera on all fronts. Robâ€™s post on the Hortonworks blog is just him trying to save face. Robâ€™s an ex-Oracle sales guy who doesnâ€™t care about open source or Hadoop. This is just how he sees a way to quickly flip a company and make some $$ in the process. Anybody looking to do business with HW should be very careful and do their own due diligence research on that mess of a company. Where is this information coming from (I know from inside connections that at least some of the stronger statements are plain factually incorrect)? Sounds like internet double negative, bad mouthing by an incompetent. John Smiley has been posting that same comment in other places. A competent bad mouth ! !